A fine art print of "Mohawk Falls" will bring fresh energy to your den or dining room. A symphony of splashes fills the air as the river bounces off the rock wall, pausing for applause in a basin shaded by birch trees. The show is best enjoyed with trail mix and a fine IPA! 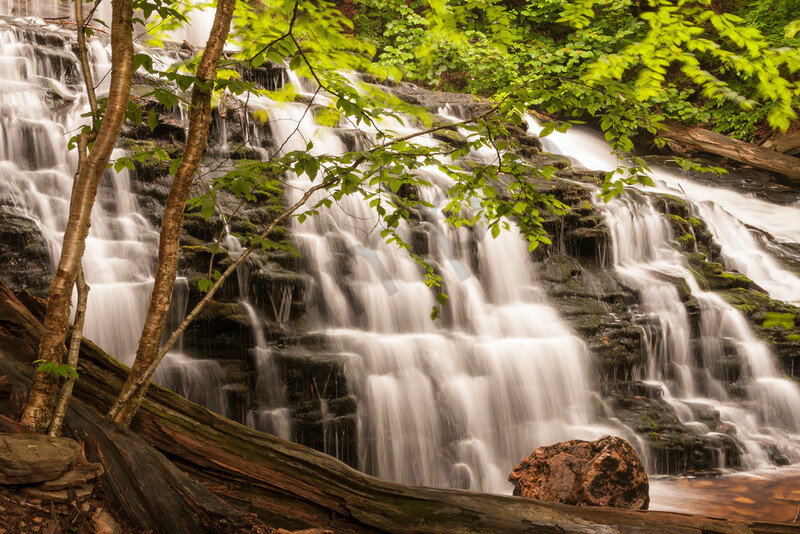 A hike through the forest of Ricketts Glen State Park, Pennsylvania is handsomely rewarded with a series of beautiful waterfalls. Each is different than the one before, and beautiful in its own way. Mohawk Falls appears quite suddenly when approached from upstream. The waters are fairly calm, and the trail seems to enter a grove of River Birch trees to the side. Pushing aside a large branch reveals the full force of the falls, a rocky wall of splashing water. A large boulder offers a shady front row seat. "Mohawk Falls" is a big part of my Waterfall Wall Art series. Best displayed on metal, the rich colors and bold patterns come to life and captivate the imagination. Each metal print is ready to hang without a frame, providing a bold, modern look. For a softer, more pastel appearance, choose a canvas print. Two museum-quality fine art papers are also available, should you prefer a more traditional presentation.